Police are hunting a hoax caller after a bomb scare left a stretch of Brighton seafront in lockdown on the day when the annual TUC conference opened. Bomb disposal experts, police and sniffer dogs searched the Grand after an anonymous caller said that there was explosive device in the hotel. The Grand was evacuated, along with the Brighton Centre next door and the car parks behind. But nothing was found and almost five hours later the area started returning to normal. 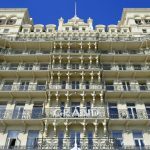 Sussex Police said: “The search of the Grand hotel in Brighton ended at 9.15pm on Sunday evening (10 September) without anything suspicious being found and staff and guests began to re-enter the hotel. “Road closures and closures of adjacent car parks are being withdrawn. “Police worked with management at the hotel after an anonymous phone call was received at the hotel at 4.30pm on Sunday, alleging that there was an explosive device there. “Thorough searches took place with the assistance of specially trained police search advisers, local officers, police dogs and military ordnance disposal experts in order to establish as soon as possible whether or not the call was a genuine one. Chief Superintendent Lisa Bell said: “It was important that this report was thoroughly looked into and we are grateful for the patience and understanding of staff, guests and people using the nearby car parks, whose afternoon and evening was disrupted. “A comprehensive criminal investigation is under way to trace the person responsible for the call.